Packing is an art form. With luggage restrictions tightening by the day, it is important to be efficient and flexible when it comes to your travel wardrobe. Maybe you bring some double-duty items – like a reversible coat or a shawl that can be worn as a scarf or used as a blanket. Or maybe you invest in thin and space-saving items that can be packed tightly into a small personal item. Maybe you commit to wearing only one jacket or a pair of shoes throughout your trip – or maybe that isn’t possible. For anyone who needs to wear a pair of shoes and transport another, there are several options out there. You could purchase a duffel bag with a separate shoe compartment, or simply throw the extra pair of shoes into the trunk of your car. But for those of us looking to bring one bag, more likely than not those dirty old shoes are going to wind up right in the middle of our luggage with our clothes and toiletry items. So instead of leaving tread marks on your jeans or getting dirt on the collar of your nice shirt, invest in one of the shoe-separating solutions below. Pack your shoes in there, and they won’t mess up the rest of your luggage. It is the easiest way to keep your items clean during transit. After all, who wants to wear clothes that look and smell like a dirty shoe? 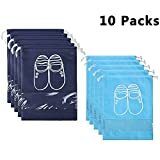 If you need to travel with more than one pair of shoes – maybe some athletic shoes, some casual shoes, and something formal, these drawstring shoe pouches are a great solution. They come in a pack of ten, so you will pretty much always have more than you need. Plus, the convenient little window in the front allows you to see which shoes are in which bag without having to unpack them. These shoe bags don’t actually zip closed, so they aren’t a great solution for something like hiking boots which are likely to hold on to a lot of loose dirt. However, they are a great way to separate your work shoes from your stinky sneakers, and a great way to separate both of those shoes from your clothes and delicates. This little shoe bag can hold up to eight pairs of shoes, zips closed, and even has two handles. This means it can easily be used as a stand-alone piece of luggage. That being said, it is also compact enough to fit into a carry-on or checked piece of luggage. 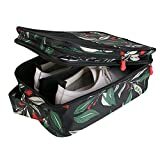 If you are traveling as a couple or with a family, this is a great way to keep all of the shoes in one place without getting anyone’s luggage dirty. It can also hang open in a closet upon your arrival, keeping your shoes easily organized and off of the hotel floor. This is a great solution for anyone with a lot of footwear, or for anyone looking to keep everyone’s shoes organized and accessible in one easy and clean compartment bag! If you are looking for a shoe storage solution with a bit more style, then consider these individual shoe bags in whimsical patterns and with a convenient top strap. In addition to being super cute (and conveniently, functioning as an easy way to tell your different pairs of shoes apart), they are very functional. Each shoe bag has a strong, durable zipper, and is water-proof. 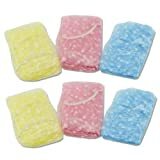 That means you can confidently zip of a pair of wet or damp shoes into one of these little bags. Pack it into your luggage without worry. They are also great for shoe storage, as they can keep dust off of your favorite kicks in your closet. They can also help to keep everything organized and easily identifiable. This is another waterproof shoe storage bag with a pretty painting. But, it is more structured than the bags listed above. This shoe bag looks a bit more like an insulated lunchbox. It has a zipper that wraps around three out of four of the short sides. This allows the entire top to be flipped open. This is great for delicate or expensive shoes that you don’t want to wrestle into a storage bag. It can even hold up to three pairs of shoes! It is also waterproof, which makes it a great luggage accessory for anyone traveling during the winter or rainy season. The mesh panel in the front allows you to easily see which shoes you’ve got inside. Finally, if you are looking for an inexpensive, DIY shoe storage solution, you can’t go wrong with a humble shower cap. Shower caps have built-in elastic that can easily be stretched over the soles of your shoes. This way, the dirtiest part of your shoes is separated from the rest of your luggage. This pack of shower caps comes in a pack of eight. You can store either four pairs of shoes if you use one cap per shoe, or eight pairs of shoes if you use one cap per pair. These shoe bag alternatives are completely waterproof (by design). You can rest easy knowing that the dirt and damp on the soles of your shoes won’t permeate the rest of your luggage. This is a quick, easy, disposable, and inexpensive way to keep your shoes separate from the rest of your luggage. Plus, it won’t be taking up any of your luggage space. Keep yourself organized and your clothes and accessories nice and tidy! These dedicated shoe storage solutions will up your packing game. Pack your bag and hit the road.